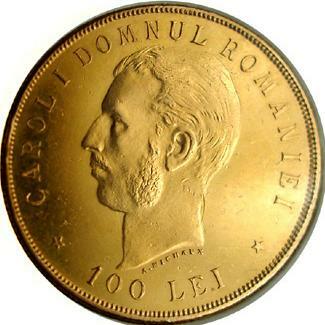 denomination * 100 LEI *, the inscription "CAROL I DOMNUL ROMANIEI" meaning "PRINCE OF ROMANIA" and prince CAROL I (with side whiskers) facing right. Under the neck lies A. MICHAUX, the engraver's name. 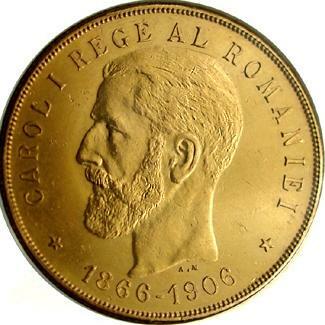 years * 1866 - 1906 *, the inscription "CAROL I REGE AL ROMANIEI" meaning "KING OF ROMANIA" and king CAROL I facing left, outer pearl circle. Under the neck lies A. M. standing for Alfons Michaux, the engraver's name. This Romanian gold coin is both huge and rare (3.000 pieces struck). 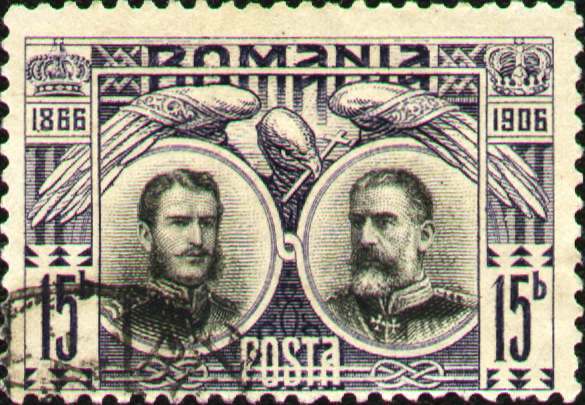 The 100 lei 1906 gold coin pictures above are present on Romanian coins through the kind permission of Mr. Radu Lissner. For a long time pictures of 100 lei 1906 gold coin were shown on Romanian coins through the kind permission of Mr. Clark Smith, numismatist and renowned specialist in world gold coins.